To end the year, my students have been making simple marking gauges. 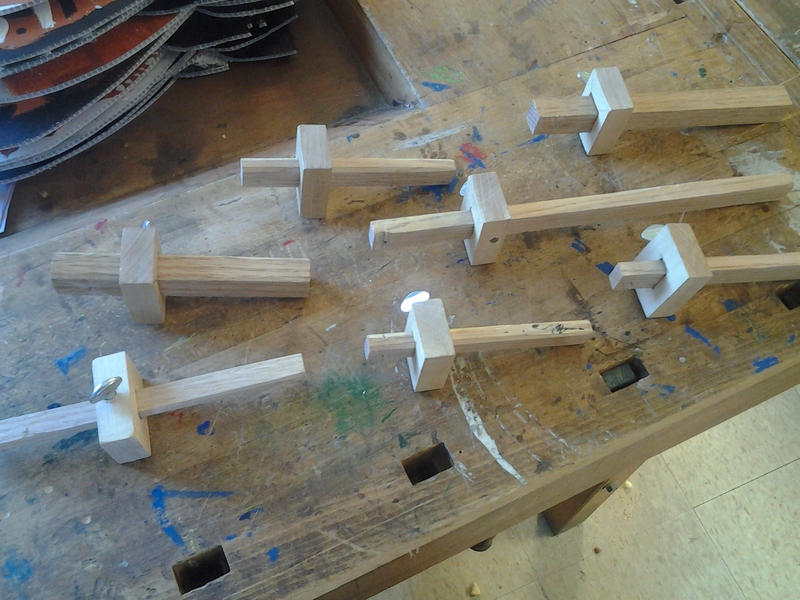 My students learned to create a mortise and use hand planes to fit a tenon in this particular project. 1. Cut a 1″ or 3/4″ square oak strip into 8″ lengths. 2. Cut a 2″ length from a maple strip about 2″ wide, giving you a 2″ x 2″ square. 3. Use the oak strip to mark your mortise in the center of the maple square. We did this by marking two diagonals across the maple square and then eye-balling the center. Mark the square with a mechanical pencils. If you feel really competent, use a try square to wrap the edges of the mortise around to the back side of the maple square. 4. Drill a pilot hole through the center of the mortise (in the waste section). 5. Use a coping saw with the blade threaded through your pilot hole to cut out the mortise. 6. Clean up the mortise with a sharp woodworking chisel. 8. Fit the tenon to the mortise – use a plane to trim the tenon enough to slide with some resistance. 7. Drill hole for the thumbsrew with a 7/16″ twist bit. Move the drill in a circular motion, widening the hole slightly. 8. Hand tighten the thumbscrew into the tenon. 9. Use a nail to drill a pilot hole through one end of the tenon. 10. Hammer a nail into the pilot hole. Clip the nail short. 11. Use a file to shape the pin into a blade shape. Do this by filing one side flat (the side towards your fence) and angling a mill file to make a spear point pin.